This week has been great; we`ve been trying our best to try and prepare Emmanuel and Carlos for their baptizms this week and Carlos has been a little difficult but that`s okay because the tough investigators are among the most faithful members afterwards. This week I`ve been reading a lot about how each one of us has to prepare ourselves for our personal interview that we`ll have with the Savior. I`ve been able to learn a lt and really appreciate this time that I have to share the gospel witht he wonderful people here in Mexico. I`ll never regreat serving a mission. Yesterday my mission president called and he told me that Tomas Pintor (one of the most awesome converts in Cuernavaca) spoke in Stake Conference!! That was such great news! He said that two angels had told him about a plan of salvation and happiness and that was just what he was looking for. WOW. I`m so grateful for these wonderful experiences that I`ve been able to have here in the mission. Elder Clayton is going to be coming to the mission in March and our zone is in charge of the musical number....*cough* I say that Sister Durham should just do it because she definitely outsings any of us haha! We only have like 2 months until general conference!! woohoo!!! Oh! Maria also got baptized on Saturday! She was an interesting case because she lives in our area but works in the area of the elders...so we all sort of shared her haha! She is amazing and is so dedicated because she wants to go to her daughter`s sealing in a year :) How awesome is that? Happy belated Valentine´s day everybody, I hope you all had a great day!! Guess what? This week we saw SO MANY MIRACLES. I don´t even know where to begin. One of our investigators, Carlos has really been stuggling and after his 4th assistance to church we had a charla franca with him because he had been doing a lot of internet research and wasn´t trusting in the Spirit or the scriptures and we actually asked him if he wanted to keep meeting with us and he said no. We were sad, but we knew that we couldn´t get unfocused because we have to help the people that are ready and prepared by the Lord...and we knew there were more...BUT...the next day we saw Carlos and he had a bandage on his arm and we asked him what was wrong and he told us that as soon as he had left the chapel (because we always have our lessons in the stake center) he started to feel sick , but really sick, (his family actually took him to the hospital) (okay some background information--Carlos takes extremely good care of himself physically --he´s always in the gym and eating healthy foods--he doesn´t even like going out in the sun because he says it´s for that reason why we have so much acne...HAHA! We´ve really had to battle with this investigator, but he´s getting use to the members in the ward and there are some great jovenes that are really trying to help him out ( we´ve got some great returned missionaries in our ward and we just tell them..¨please be his friend¨ and they totally get it. Gosh, I´m going to be the best friend of all the investigators in my home ward when I get back! Our other miracle is Emmanuel. He´s been to church 4 times, but has never accepted a baptismal date...but he has great friends in the ward and he was actually a reference from one of the young men in the ward who is preparing to go on a mission and this same member is bring Emmanuel to seminary every morning before school. We had a little charla franca with him too...not too franca because we weren´t going to stop teaching him, we just wanted him to know that he was ready to accept this ordinance of baptism ...and during the lesson we actually told him...¨Emmanuel...you´re ready and you know you´re ready.¨ He then said ¨Yeah..you´re right¨and he smiled and it was such a beautiful experience. I hardly remember what I said during the lesson...it usually happens that way, I love how the spirit works. It´s beautiful. The Lord lets us serve Him for this short time and He puts us in the place where He needs us with the people that need us and in the place where there are people waiting just for us! Missionary work is SO exciting! I really know that the Lord needs me HERE...in Iguala! It´s so exciting and it´s pretty hard to put into words... Carlos and Emmanuel are going to be baptized on the 28th and I can´t wait to see them dressed in white. The Lord really has a personalized answer for everyone of His children. On Saturday we also had the opportunity to do a mission activity with the young men and young women from the stake and it was great. The young members of the church are great and I love their energy and excitement for missionary work! These pictures are of :a part of my zone right now, the group of girls that we went out with on Saturday....and a picture that I don´t really like because I don´t really like stuffed animals, but my companion took this picture of me and I´m basically getting toasty brown. Haha! Have a great week everybody! Okay so first of all last Saturday our Ward did a talent show and all of the missionaries did 2 skits. It was hilarious because I was assigned to be the old lady and also a director a a movie and if I coud upload these videos I would, but I´ll have to show them to you guys afterwards. My companion and I also share the Ward with the zone leaders and right now there are 3 of them because one of them is going back home next Monday! The next change my companion is leaving and in 2 changes I´ll be the one leaving, how scary? But it was a HUGE success...the kids from the Primary danced too and it was so cute. These little Mexican kids sure know how to move their hips! The little 4 and 5 year olds were dancing super good too! and the Young men and Young women group did a hip hop dance by Rihanna...it was also SUPER good....gosh, all I did was wobble around with a head shawl and a cane, but the whole activity was a success. On another note....I´ve never drank so much Coke in my life. Seriously, before the mission I didn´t even drink that much soda, and now I´m drinking Coke on a daily basis and tortillas with just about every meal. The transition to food from the states should really be an interesting one. This week was great, we`ve really been able to help 2 investigators and we`re still working with them, but they`re progressing little by little. One of the boys is Daniel and he just wants to know what his purpose in life is. We talked a little with him about the need that everyone had to come here to earth and get a body and we also talked to him about free agency and at the end of the lesson we all kneeled down and he offered a beautiful pray ...he literally started out ¨God...do you exist?¨Whew...the tears started flowing, it was such a beautiful moment and we`re really trying to help his recognize the Spirit in his life and that he really does have a purpose of being here...life just isnt about living and then dying..it actually have a grand purpose. Isn`t that just so exciting? We`re also working with a boy named Carlos...his family has been Catolic forever and they don`t go to church but it`s a family custom. His family really doesn`t support him either. And when he went to pray about everything we`ve taught him he told us that he can`t feel anything other than he`s catholic and nothing is going to change it. We`re trying to help everyone of our investigators to be able to recognize the Spirit in their lives because we aren`t even the teachers, it`s the Spirit that does everything. I love being a member of this church because other churchs will just tell you to believe because we should all have faith...and something that I`ve been able to notice is that in this church there is a big focus on praying and asking God for yourself. We always tell our investigators that they have to ask God for themselves and not just believe us because we`re missionaries telling them that they should believe. I really do like being a missionary. This week was a little more difficult and easier than last week...it´s sort of hard to explain because on one hand we´ve got to take care and visit all of these people, but on the otherhand we can really see who is progressing and who really is looking for something new in their life. But I´d much rather have too many people than not enough people, because that´s happened before, and it´s not fun either. Basically we have 6 people that are progressing...we have Agripina who is this 83 year old lady who is still going, just like she was 40. She has a great memory and she walks just fine! So we´ve been working a lot with her and the best thing is that she has a friend in the ward who sometimes goes by for her. We´ll have to see how her progress goes, she´s a lovely lady though,....she sews little tortilla napkins and makes pillowcovers...by hand. WOW. Hey, if I¨m that good at 83 I definitely won´t have any complaints. We´re also working with Aracelia, Jose and Angel...it´s a young mother with 2 young boys. They went to church yesterday for the first time and they all are looking for a church so hey...we´ll see how they progress, but it´s looking good because they´re actually reading and doing their research about the Book of Mormon and everything, which is really awesome. We also are working with this 18 year old, Carlos who is really kind and sweet...he says yes to everything and he totally goes to church by himself! It´s sort of hard to meet with him because he´s studying, but we´re trying to find all the options to see him whenever he´s got a sec. We´re also teaching this middle aged man, Cipriano who was in an Israelite religion for 10 years and his parents were Catholic -like everyone´s parent´s here-- and he has also investigated the Jehovah´s Witness´s so he basically has a bunch of questions and we´re doing our best with him but he still doesn´t want to pray in the name of Christ, it´s an interesting situation, but we´re still working with him. Really the thing that we´ve noticed is that the ward involvement is key. If the ward members aren´t involved in the fellowshiping of these investigators it makes everything a little bit harder when the missionaries get changed out. Our leaders are taking a lot of care of us right now here in Igual, Guerrero. We have to be inside with the door locked at 7pm, but we have permission to be out until 8pm if we have a member who has a car. So we´re trying to work with what we got. My companion is still AMAZING. We get along great and we haven´t had any problems...She´s my 3 Columbian Companion...and there are only Columbian Sister´s in the mission...soo...it´s definitely been awesome. The Spanish that I have learned here in Mexico is definitely different than a lot of other countries because they have their own slang. But I love it! So it´ll be a Mexico Spanish with a Columbian twist and a Peruvian influence. We´ll have to see how that goes, hahah! I love you all! Oh this morning we went to this Sister´s house in the ward and she sells Herbalife and I didn´t even know what that was when I came here and she says that it started in the states...that just goes to show how involved I was at home! haha! She gave us each a shake and it wasn´t actually too bad. When I get back I´m totally going dancing with my friends back out at BYU ...the music here sometimes is really awesome. Okay, see ya everybody! Oh, we also had splits with the Sister Training Leaders and it went great! Sister Young and Sister Sturt are really awesome and it was probably one of the best days that I´ve ever had with the Sister Training Leaders! Today we went to Taxco and it was amazing. It`s such a beautiful town and it totally was worth it although I totally got dizzy on the way up...there are so many curves and bumps in the road. There is a huge statue of Christ and also a waterfall. My companion and I really enjoyed it and I can`t wait to eventually come back someday. I love Mexico, really the culture is beautiful and I`ve really been able to get close to the people here. My companion and I get along great, we both are hard workers and we both get each others` humor and it really is amazing to see the miracles that Heavenly Father is giving us. I can`t wait to hug everyone when I get home, but I still have 16 weeks to work the hardest that I possibly can here in my area with my companion. Yesterday we went to church with 6 little kids and they LOVED it. They come from a family that`s on the humbler side and they don`t understand really well because none of them go to school, but something that they do understand is how to feel the Spirit. They really know that this gospel is real because they can feel it and feeling makes all the difference. I love my family so much, I`ve been able to really appreciate them and understand the meaning of what a family really is just by being with so many different families here in Mexico. I can`t wait to eventually have my own family with my own little kids. The Lord really does provide when we let him guide us. I`m working hard, I`m behaving, and I hope everyone else is doing the same! haha! Have a great week! Igual definitely is not Cuernavaca. I think it might take me awhile to get use to it after being in Cuernavaca for so long but I actually love it! It´s hot...and when I say hot I mean HOT...and the funny thing is that apparently the heat doesn´t start until May...but I´m pretty sure I´ll still be here in May (I have 3 changes to go ---a change is a period of 6 weeks) so I´ll be able to appreciate it in its fullness! The people here live more humbly than the people in Cuernavaca. We don´t use too much public transportation; we mostly walk. In Cuernavaca people usually say that it´s really hard to find people that are receptive to the gospel...but my companion Sister Durham and I were blessed to be able to find people that truly were ready to be baptized...and here in Igual they say that it´s the area where people ALWAYS are able to find people to listen and accept the gospel...but we didnt have any investigators at church on Sunday so we´ll have to try even harder this next week. My companion and I get along amazingly. There are only 3 Columbian girls in the mission and I´ve have the opportunity to be companions of all 3! Hermana Silva is ending the mission in 11 weeks and I´ll be ending in 17 weeks. It seems like time really is going by super fast. We both think that we´ll be ending our missions in this area that we´re in. Today we stayed at home all day cleaning because it was time that that house was shown a little love. I then made my companion and I spaghetti and she loved it! She´s going to teach me to cook some Columbian food next week. Hopefully next week we´ll be able to go to a place that´s called Taxco. It´s beautiful and I can´t wait to go!!! My companion and I totally got these Peppa the Pig crowns from this little girl who we ate with yesterday! Peppa the Pig is a huge hit here in Mexico...I don´t know how it´s doing in the states but Peppa is basically the next Dora the Explorer. So we had 3 baptizms on Saturday! Woohoo! Seriously, these people are so amazing and literally they were truly ready to receive the gospel when we found them. I love being a missionary and I love helping these people. The man`s name is David...he literally thanked us because he told us that he thought his life was fine and he thought it had a purpose...but them as he got to understand and live the gospel he was really changed and he noticed a huge change in everything. We sang a musical number at his baptizm...¨There`s Sunshine in my Soul Today¨....which was actually pretty interesting because all Saturday we were literally DYING because of these cheese filled chills we ate and well they basically killed us. I won`t include the details, but I`m glad that`s over with now. Rosario and Dante are adorable, I love them, they`re amazing. They`re going to move to el D.F. in a month and they told us they`re going to try looking for the church when they`re there too so I really hope everything works out! They are amazing and they only thing Dante is asking the Reyes for tonight is a pair of church clothes (Los Reyes Magos is basically another chance for the kids here to get presents, what?! it`s pretty cool though). Oh yeah...so I`m no longer in Cuernavaca, La Pradera...I`m in Iguala..with Hermana Silva. It`s pretty interesting because there are only 3 Columbian Sisters in the mission and two of them I`ve been able to train...and Hermana Silva is going home in 3 months (she`s the third), right before I go home! 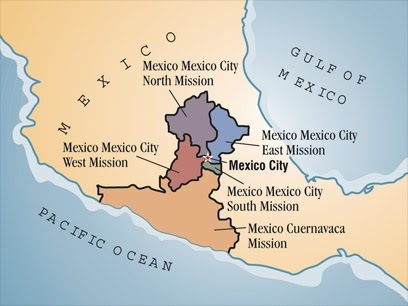 I`m pretty excited to be here in Iguala...It should be great, I can`t wait to get to know the ward a little better and the members too!. We don`t have light right now in our house, but that`s okay, I guess we`ll get that figured out later, but I`m ready to get to work! This week was Christmas! Heck yea! It was awesome because I got to talk to my family...and I basically had a little breakdown over Skype it was horrible! I´m sure if any of you would have been there you would have laughed at me, I was a laughing crying wreck! But that´s okay because the mission continues and we have 3 baptism coming up this Saturday! Heckka yea. Rosario and her son Dante, and Dave (Super Dave). This Christmas I was able to do something really awesome for one of our investigators and I just have to share it because this is the best Christmas gift I¨ve ever given and well...it was free!! Dante is 8 and the only thing he asked Santa for this year was a little hymnbook...and Rosario´s husband lives in Mexico City on a military base and he went to the temple bookstore, but it was closed when he went! Oh no! So Rosario was looking everywhere for a little hymnbook and I told her to just take mine. We went 3 days later and the first thing he took out was his little hymnbook covered with Sesame Street stickers! Hecka yes. I think I just literally made someones Christmas and it was totally worth it. I´m going to attach a picture and you guys can be the judges of that smile. The 24th was definitely the big day here....it´s basically just as big as Thanksgiving in the states. Maribel and her brother Aldo invited us over to eat with them and it was great. They´re the only Peruvians that I´ve met here in the mission and they´re legit. and they know how to eat! I loved eating with them! They also lent us sweaters and coats because all Wednesday morning in the storming and raining....which is really weird weather during this season ...so we showed up to their house soaking wet and cold...so they lent me this Peruvian pancho- scarf thing. It was awesome! Haha! We were also invited to go eat at our friend Luz´s house. She´s so nice and she has a little puppy dog that really wanted to be invited to dinner too haha. I´m really glad that I´ve been able to spend a second Christmas here in Mexico and I can´t wait to share you guys all my stories when I´m actually home, it´s been quiet a ride. Tomorrow I´ll have 14 months here in the mission.4 more to go!! This week we traveled the Cuernavaca again to help my companion out with her visa. One the way there the police stopped the bus and asked to see everyone´s ID! Ha! My companion was all panicky but I whipped out my ID and I just told the police that she was with me...haha! Talk about feeling legit! Oh and before we got on the bus there was this bag checker guy who´s suppose to check the bags to make sure we´re not bringing anything dangerous onboard and he totally didn´t ask me to check my bag..it was pretty funny though because I asked him if he wanted to look at what I was carrying and he replied ¨oh yea..of course,¨ ....do your job! haha! ït´s crazy what can happen here in the mission. I still can´t believe I´ve been here for 4 months! I´m looking more and more Mexican everyday! I love you all!